Hoops in the Highlands was recently featured on www.GreenDallas.net! Read the whole article below, and visit this City of Dallas website here: http://greendallas.net/2017/04/05/lake-highlands-junior-high-get-creative-recycle-hoops/ A huge “Thank You” to Cindy Engel for spearheading this initiative for Hoops this year! Every year, Lake Highlands Junior High School and feeder elementary schools host a huge 3-on-3 basketball tournament called “HOOPS in the Highlands” to raise funds for their local PTAs. When there are concessions and water bottles for 764 players and their families, a lot of waste is generated. Past attempts to recycle were frustrated by attendees dumping items in the wrong bins – imagine water bottles covered in cheesy nachos. This year, the event organizers placed recycling bins next to all garbage bins and ensured that they were all clearly marked with appropriate labels. They also added lids with holes to the recycling bins. These strategies helped minimize the amount of trash that went into the recycling bins. High winds created an issue in the afternoon with bags blowing around and bins tipping over. They have decided that next year, they will use binder clips to keep the bags pinned to the top of the bins, and place bricks in the bottom of the bins to help keep them from blowing over. These easy and creative solutions will help keep their games clean and reduce waste. 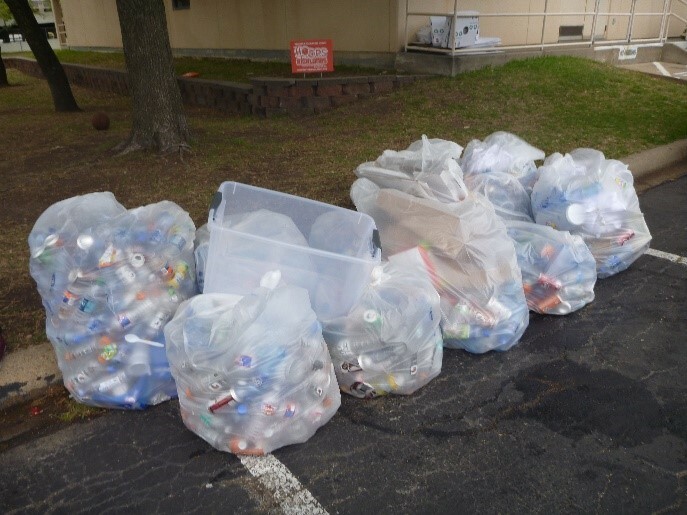 At the end of the HOOPS tournament, about a dozen oversized bags with cans, bottles, and other recyclables were taken to the City of Dallas’ blue recycling dumpster at the junior high instead of ending up in a landfill. Over a dozen medium and large boxes were flattened and recycled. Most of the trash and recycling bins were in good enough shape to store for reuse next year. Recycling can be a challenge, but it doesn’t have to be difficult. Remember, the City of Dallas has community recycling drop-off locations around the city to make it easier for our residents who don’t have access to roll carts.